These illumination options for hands, weapons, and entire scenes let officers see what's important, no matter the situation. Known for providing apparel and gear to outfit you from head to toe, 5.11 Tactical (www.511tactical.com) also offers a wide range of flashlights for different applications. 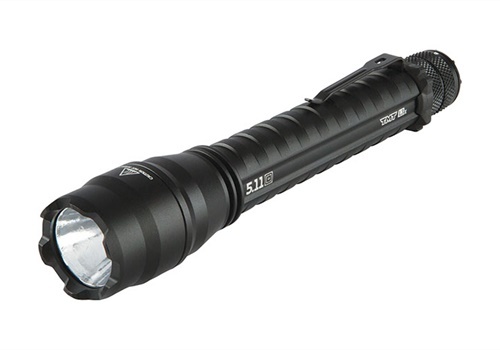 5.11 Tactical's TPT R5 14 Flashlight is a lightweight full-sized rechargeable duty light that features a squared head to prevent rolling, a smart switch to silently toggle between high, low, or strobe modes, and a Cree XM-GB LED light source. The TMT L3X Duty Torch offers high and low lighting modes, a momentary-on toggle, and an intelligent switching feature. It runs on three CR123A batteries (included). Elzetta Design (www.elzetta.com) manufactures modular flashlights, dedicated weapon lights, and flashlight mounts. The company's latest product is the Elzetta Bones Flashlight. 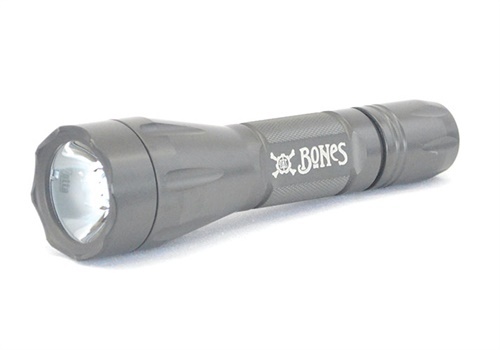 As the name implies, Bones is a bare-bones flashlight with a lower price point. It produces 650 lumens and activates with a quiet, simple click switch. This light is finished in natural gray Type III hard anodizing and projects light through a field-replaceable solid-acrylic optical lens—there is no reflector. The Bones Flashlight is made in the USA. 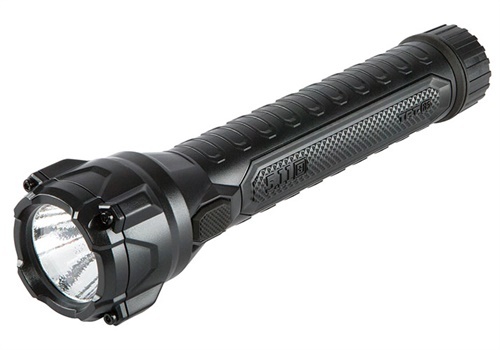 First Tactical (www.FirstTactical.com) recently launched its Small and Medium TriTac Flashlights. The TriTac Lights are powered by Duracell Ultra CR123 batteries (included) and feature an Intelligence Button system with a half-second delay to help users easily find the correct light mode. The Small TriTac Light features 261 lumens on high, 86 lumens on low, and 18 lumens on map mode. The Medium TriTac Light provides 444 lumens on high, 154 lumens on low, and 18 lumens on map. New features include an end cap button protector, three modes, and space for laser etching. Littlite (www.littlite.com) has been making handy task and map lights for years. But now they can be ordered as a selectable White/UV output configuration. Use the 365nm UV LED for checking security watermarks on ID cards and currency, then choose the white mode to use as a standard task light. 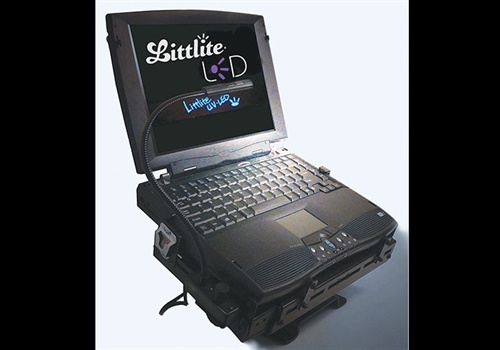 Littlite task lights are designed and manufactured in the USA and can be mounted on most mobile laptop mounts. Pelican Products (www.pelican.com) is known for its hard cases and its flashlights. 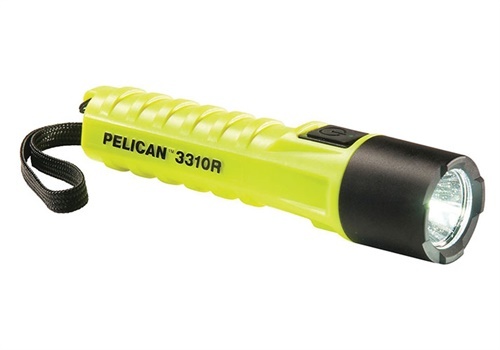 The ultra-compact rechargeable Pelican 3310R LED flashlight uses a lithium ion battery, is IPX8 submersible, and has a "boost mode" that temporarily increases the light output to 1,067 lumens. 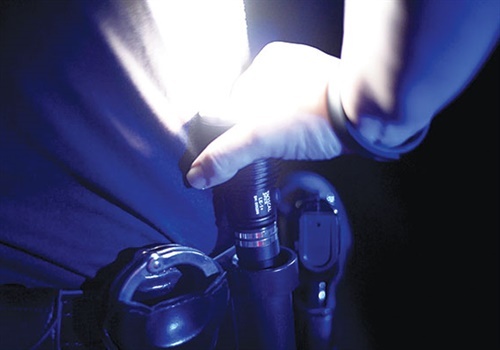 The six-inch Pelican 7600 LED can produce more than 900 lumens of white light and toggles to night-vision friendly red and green LEDs for traffic control when used with an optional wand/holster. It can run on a USB rechargeable lithium ion battery or disposable batteries. 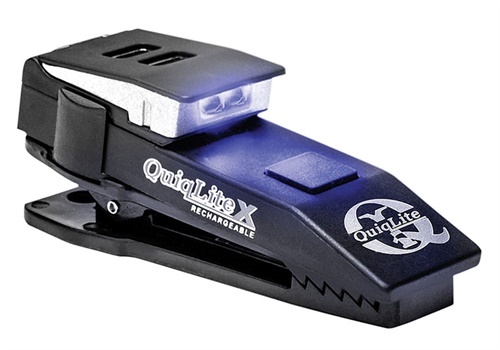 QuiqLite (www.quiqlite.com) makes small hands-free lights designed to clip to a uniform pocket or MOLLE webbing. The QuiqLiteX UV/White LED model is USB rechargeable. It's designed to authenticate security features on documents like driver licenses with its "UV" 380nm LED light. The "white" LED light can be used at 20 lumens to maintain night vision or 70 lumens for normal reading. A single on/off button lets you choose ultraviolet LED light, white LED light, and flashing personal emergency strobe. All 2017 Quiqlite models are also equipped with a pupil gauge on the back to measure pupil size and help determine if a subject is under the influence of drugs or alcohol. Streamlight (www.streamlight.com) manufactures all sorts of lights. The company's Strion DS (dual switch) is a multi-purpose rechargeable compact handheld light. Both the push-button tail switch and head-mounted switch let you use TEN-TAP programming for a choice of three preprogrammed operating modes. The Strion DS lithium ion battery is rechargeable up to 1,000 times. If you're interested in a weapon light, the TLR-6 Rail Mounted tactical light features an integrated red aiming laser in addition to its C4 LED illuminator. Ambidextrous switching lets you choose laser only, laser/LED combo, or LED illumination only. Batteries can be replaced with the light mounted on the gun. SureFire (www.surefire.com) offers all manner of lighting options, including weapon lights. The X300 Ultra - A is compatible with pistols or long guns thanks to its Rail-Lock. 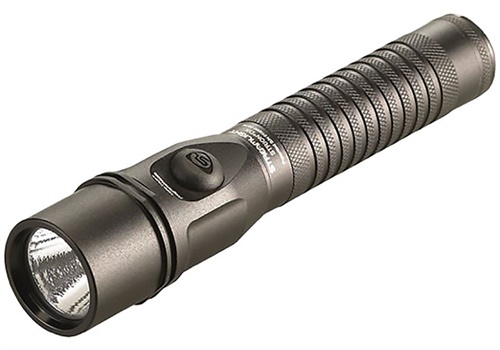 This newly enhanced version of the SureFire X300 Ultra delivers 600 lumens of LED-generated output and a high-intensity beam with a larger center spot. Ambidextrous switching provides one-finger control. 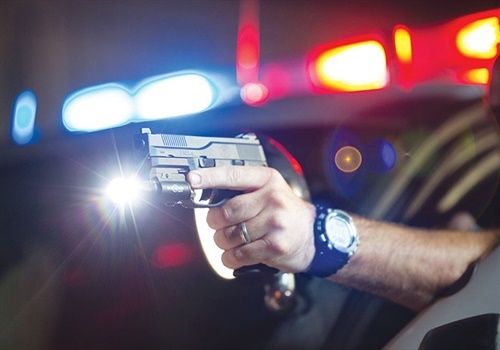 For an option that will accommodate concealed carry, the XC2 ultra-compact LED pistol light is SureFire's smallest, most lightweight handgun light with an integrated laser. It features a "recoil-proof" LED and broad 200-lumen MaxVision Beam. The XC2's 635nm red laser is made to be highly visible and rarely need re-zeroing. It measures less than 2.5 inches long and weighs just two ounces. Ambidextrous switching provides both momentary-and constant-on activation. The LE-1+ duty light from Tactical Impulse (www.tacticalimpulse.com) features tail-attachable accessories to provide versatility. An electronic "traffic wand" tail attachment transforms the light into a traffic control tool, providing for bright wand signaling and simultaneous main flashlight use. The flashlight is also able to detect its Smart Holster, and automatically keep itself off while holstered. In the newest LE-1+ model, an optional user program allows the flashlight to remember its operating state prior to holstering, and then automatically return to its state simply by deploying the light. Tele-Lite (www.tele-lite.com) is a U.S. manufacturer that produces and assembles virtually all its lighting products in house. 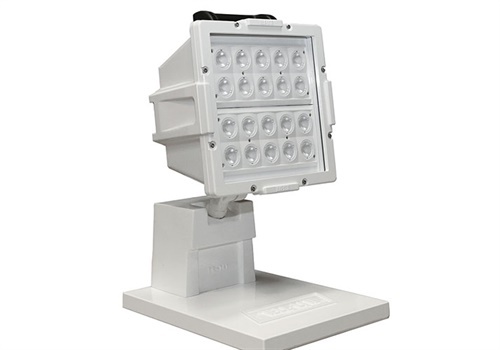 The company's portable floodlights fold flat for storage and feature rugged aluminum castings, a white appliance finish, and insulated water- and heat-resistant handles. Options include storage brackets, ladder/door brackets, and tripod attachments. The P-5 model produces 10,000 lumens of quartz halogen light, while Tele-Lite's new P-5LED model produces 15,000 lumens of light and draws one amp. You can connect six LED portable flood lights to one generator to light up an entire building (https://youtu.be/jYMy0Kcsv6c).